Mandi began practicing yoga in 2001 during college and immediately enjoyed the exercise and stress relief yoga offered her. After that, she continued to enjoy taking yoga classes while she worked in the social services. However, it wasn't until 2008, when she was given the incredible opportunity to spend a year and a half living in India that she discovered her true love and passion for yogic practice. This for her was a truly life changing experience. 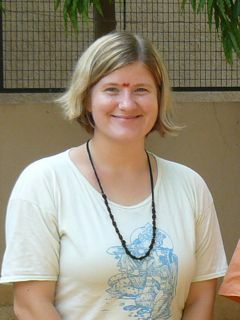 She practiced and studied yoga and vedanta with Swami Krishnananda Saraswati at the Surya Jyothi Yoga Vedanta Centre in Bangalore, India. It was here that she taught her first yoga classes. She completed her yoga teacher's training and earned her certification at the Sivananda Yoga Vedanta Meenakshi Ashram in Madurai, India. Mandi believes very strongly in these classical yoga teachings and strives to bring that knowledge and awareness to her classes. She teaches a traditional Sivananda yoga style which is a good balance of breathing (Pranayama), postures (Asana), and relaxation (Savasana). She also leads classes in Kirtan devotional chanting, which she discovered having immeasurable benefits in her own life. Mandi has also found a way to merge her love of yoga with her desire to continue social work, by teaching Special Needs Yoga classes for people with developmental disabilities. Mandi offers yoga as a holistic approach focusing on the body, mind, and spirit. She believes very strongly that yoga is for everyone and works to create a space where all people can gain the contentment and peace of mind that comes through yogic practice. Om Shanti.